Are you thinking about buying a pallet dispenser or just being curious to know what a pallet dispenser will do for you and your business? – Don’t worry; Q-System has gathered the top 8 advantages of the PallEvator pallet dispenser from Q-System. Number 8: The PallEvator is 100 % electrical. You can save up to 80% in operational costs compared to a pneumatic pallet dispenser. Being electrical, the PallEvator is super flexible in the sense that you can place it anywhere, as long as there is an electrical plug nearby. Q-System has more than 50 years of experience manufacturing pallet dispensers. That means that our service team knows all the solutions to the possible issues that might be. Not only that, the PallEvator has more than compatible prices. Number 6: The PallEvator can handle 1-100 pallets. Q-System provides a wide selection of PallEvator pallet dispensers, making it easy for you to find the PallEvator that suits your needs. 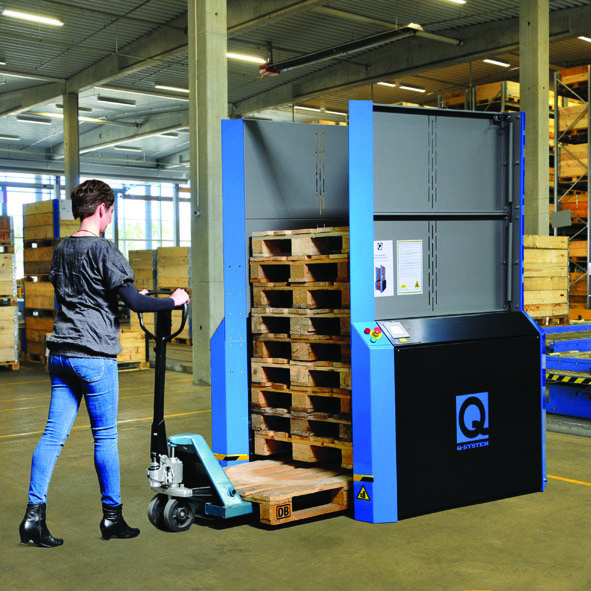 The Q1 – our bestseller – can handle 15-25 pallets, the Q½ made for half pallets, the Q Double can handle 2 pallets in extension of each other, the Q5 and Q-Tower can handle 25-100 pallets depending on the needs. Last but not least we have the Q In-line that is designed for incorporation into a conveyor system. Number 5: The PallEvator can handle any type of pallets. Do you use other types of pallets than euro pallets? Then we can customize the PallEvator so it fits the pallets you use – whether they are made of wood, plastic, metal, or a fourth type. The same goes with pallet sizes! Number 4: The PallEvator can be customized to fit YOUR exact needs. We can customize your PallEvator to fit different types and pallet sizes. Besides that, the PallEvator line features many different options or accessories that optimize safety and the experience of the PallEvator. You can add Truck Protection Barriers to protect the dispenser, Pallet Infeed that helps you to make a straight stack, customize the color and much more. Number 3: Safety is first! All PallEvators have inbuilt safety sensors that disconnects the dispenser if anything gets in the way. 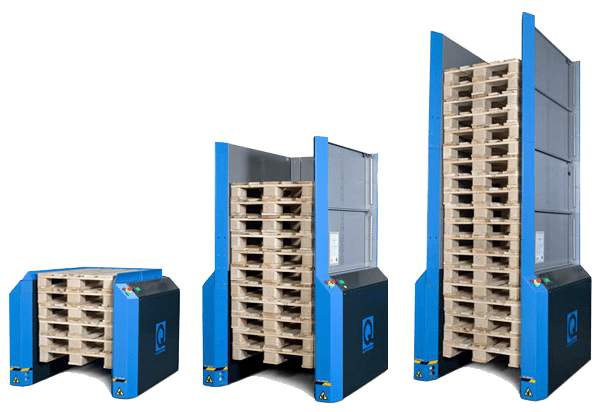 You can also add Full Indicators so the stack of pallets doesn’t surpass the maximum capacity and eliminate the risk of pallets falling out of the dispenser and the risk of overloading the motors. Number 2: Increase the productivity. With the PallEvator you will gain an optimized pallet flow, less time per pallet – the PallEvator can handle 156 pallets/hour – Improved internal logistic and a cleaner warehouse/production area that all adds up to an increased productivity. Number 1: Better working environment. There is no need for manual pallet handling with the PallEvator, so no more heavy lifting, which results in fewer work related sick days. Also you’ll get less truck driving resulting in lower noise level, better air quality and in the end a better indoor climate. So if you want a better working environment, increased productivity where safety is a high priority and at a reasonable price, you should consider a PallEvator pallet dispenser from Q-System.